You don’t just like tacos. There is no such thing as liking tacos. You either love tacos, or you don’t. And Dallas-Fort Worth loves the hell out of tacos. This collection of taquerias and taco slingers offers you the best tortilla-based treats across a range of tacos available in the region. Some come with cheese on the inside. Some come with cheese on the outside. But as long as you love tacos, you’ll be in good hands no matter where you go. ¡Buen provecho! At the corner of Kiest and Hampton sits this lucha libre-themed taqueria Maskaras (the slang spelling of máscaras, “masks,” in Spanish). The space is decorated with the owner’s personal Mexican wrestling memorabilia, including vinyl figures, memorabilia from El Santo, Blue Demon, and Rey Mysterio, and masks available for kids to try on and go wild with. Thankfully, the food backs up the spectacle. 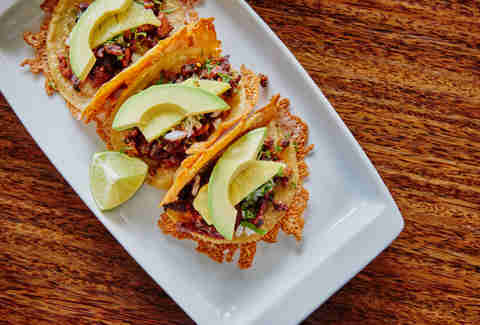 The taco maskaras, which upgrades the rich, soft, well-seasoned carne asada taco with the addition of melted white cheese between the beef and the tortillas, as well as garnishes of pico de gallo and avocado wedges. It’s a taco as flashy as a luchador match and just as exciting. 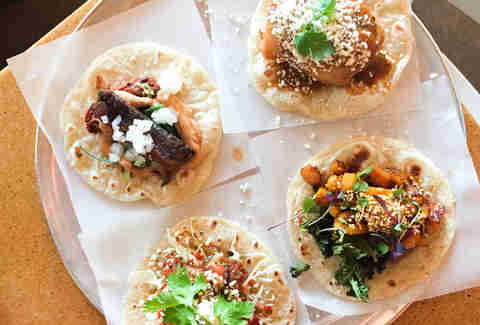 From hush-hush backyard taqueria to nationally lauded brick-and-mortar taco joint, Trompo has had a helluva 2.5-year journey. It’s well-deserved. 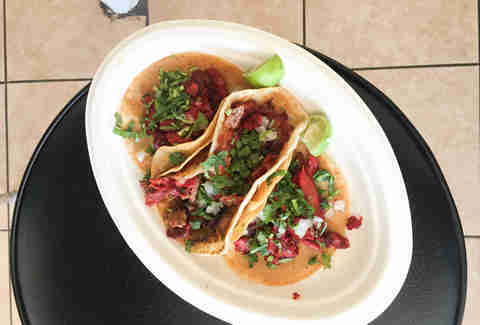 The Monterrey, Mexico-style taco de trompo -- named both for the vertical spit on which the orange-red pork is roasted and to distinguish it from its regional cousin, the taco al pastor -- is a crispy, knotted ode to all that is right with tacos. The punchy spice is delivered by a paprika-based marinade -- not the achiote and chile-grounded seasoning of tacos al pastor. The only thing that makes the taco better is jazzing it up by subbing in a semi-translucent Sonoran-style flour tortilla, mozzarella, and grilled beef. You’ll find this iteration listed as a campechana under the menu’s quesadilla section. But pay no mind to its placement. It’s all marketing and business. A campechana is, in fact, a taco. Your favorite taco spot probably doesn’t use fresh nixtamalized masa -- the kind used by the Aztecs -- to produce its corn tortillas. 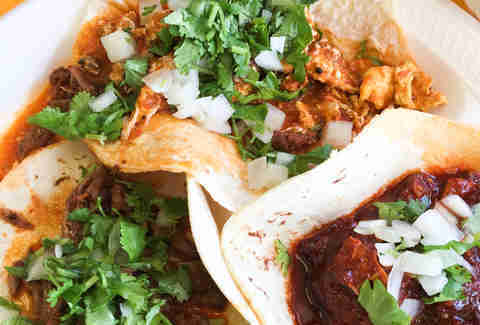 Urban Taco does, and does it with secret kicks in its taco al pastor a la Tuma. An homage to taco cousin la costra, which replaces a tortilla for fried cheese, the a la Tuma is a stout taco of manchego cheese fried to a corn tortilla with a filling of al pastor sliced from the trompo and bathed in habanero salsa. The package is topped with a slice of pineapple and a wedge of avocado. Take care when eating it, though, tucked between the cheese and tortilla are a few slices of jalapeños. Simple tacos are often the best tacos. Think, a tender slice of slice of beef brightened with squirts of lime juice and salsa roja. 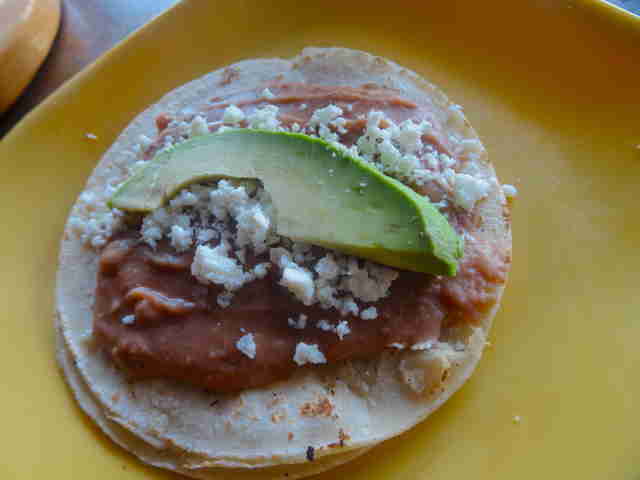 Or in this case, think a schmear of refried black beans, a shot of queso fresco, and a cool avocado slice. 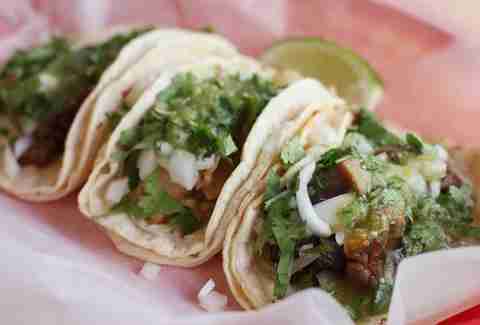 That’s El Come Taco’s Jose taco, so named for taqueria co-owner Luis Villalva’s father’s favorite taco. 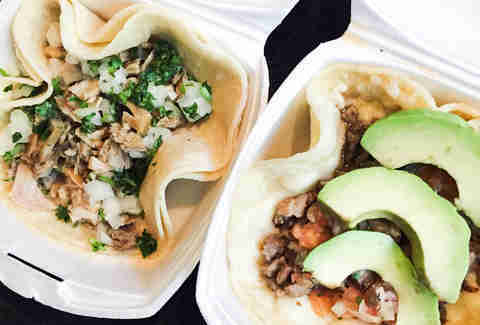 The cauliflower, short rib, and pork belly tacos on fresh, airy flour tortillas are enough reason to become a regular at this Lake Highlands taqueria, but the weekly specials are sufficiently tempting so that you’ll want to return every Taco Tuesday. It’s with those offerings that chef-owner Andrew Savoie and his staff flex their imaginations with traditional tacos. 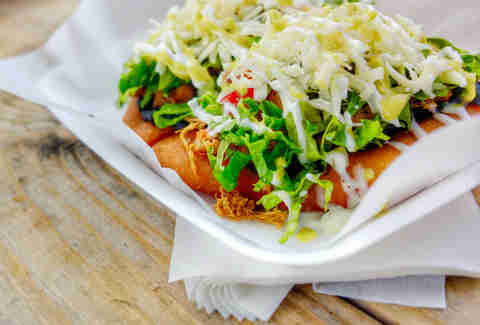 The green chorizo, a specialty of Toluca, Mexico, is seldom seen in these parts. At Resident it’s a loose, herbaceous pile with peeks of mint. A meatball taco, a classic taco de guisado, trades a thin tomato sauce for a thicker red sauce evocative of Savoie’s Long Island roots, where marinara trends sweet with sugar. Agave syrup stands in for sugar in the sauce. And then there were the pastrami taco with a mustard béchamel and another taco with served with a sliced hot dog. There’s only one way to eat this local chain’s fatty beef cheek meat taco in diminutive doubled-up tortillas: pick up the taco, fold it, and then slurp the filling from the opening. Happiness ensues. Only then should you eat the parcel like a regular taco. While there are several La Banqueta locations across DFW, the outpost attached to a gas station near White Rock Lake is my favorite. There’s plenty of space to sit, La Banqueta’s signature international currencies taped to the mirror are there too, but the service is incomparable with the other branches. As with all La Banquetas, payment is made after the meal and it’s closed on Sundays. 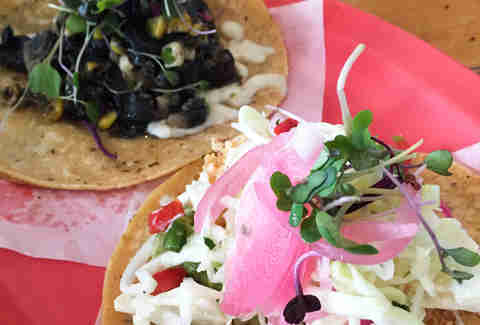 Revolver Taco Lounge is synonymous with real estate drama that for more than a year pitted property owners against restaurant owner Regino Rojas and his family. Were they going to lose their lease? Would they get more parking? Are they going to open a new location in Dallas or relocate within Fort Worth’s city limits. Well, at last the Rojas’ shuttered the original West 7th outpost and reopened in a large space with a long dark wood bar and stenciled revolvers on the walls, a small room for their Mexican guisados brunch, and between, the main dining space. A spray-painted mural of Mexican demons and supernatural beings decorates a side entrance. Dishes like Mexico City’s long, narrow machete quesadillas and the stellar, almost sweet, rabbit carnitas with chunks of buttery avocado and a dusting of queso blanco have joined the menu at what should be considered the best taqueria in Texas. The beefy bramble tucked into small doubled-up corn tortillas and topped with zippy pico de gallo is a small treasure. But not one available before 10:30am. If a customer requests one at 10:25am, the barbacoa will be ready, but will not be served. The rejection will be swift and curt. Never mind that barbacoa is commonly served for breakfast. 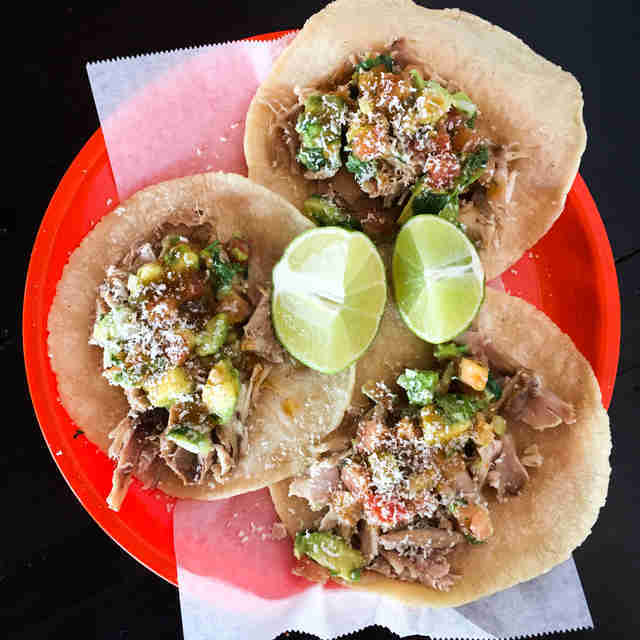 As annoying as that might seem, the kitchen, overseen by owner Emilia Flores, doles out exceptional barbacoa with just the right amount of glistening fat. It deserves to be a default order along with the juicy, mouth-puckering picadillo and the hiccup-inducing habanero-peanut salsa. But before you go, grab a spare coat to donate to Taco Spot’s Leave a Coat, Take a Coat clothing rack. This taco truck with a splashy wrap shells out the only Navajo fry bread tacos I’ve encountered in Dallas. That alone doesn’t earn it a place on this list. It deserves a place here because of the approach to the fry bread tacos and their flavor: a seamless blend of Native American and Latin American foodways. Instead of the fry bread taco’s typical chili beans and ground beef, Mayan tacos come with refried black beans and the protein of your choice -- that should be chicken -- that is then capped with fresh lettuce, onions, tomatoes, cheese, and a lattice of crema. It’s a delightful mess of cool and spicy, smooth and chewy. Tortilleria El Characo is one of those elusive “hidden gems.” It’s also tiny, with a small dining room cluttered with tables, snacks on wire fixtures, and tchotchkes that is separated from the kitchen and tortilla factory by a steam table where customers can choose their guisado (or stew) of preference served atop a fresh corn tortilla. Go for the costilla, cubes of ribs slow-cooked in a dark-chile sauce. Note the chocolate, coffee, and candy notes, and grin. Don’t forget to ask if carnitas were made that day. And if they were, get yourself a taco. The renditions of modern Tijuana’s creative seafood tacos served by owner Jesús Carmona and his team have given Dallas yet another regional Mexican option. They’ve also given Dallas a one-two taco punch like no other. One is the CriscoKidd fish taco, chicharonnes-crusted mahi mahi with avocado mousse and crema fresca. It’s a surprising light parcel, and available only on Tuesday. The second taco is an especially surprising one for me, as it’s named after me. The Ralat chile relleno Taco, available Thursdays, is a sweet chile packed with roasted corn, yellow squash, zucchini, and asadero cheese that gets a pile of marinated shrimp, cream, and micro greens on corn tortillas made up the road. Go ahead. Get a bite of me. José R. Ralat is a Texas-based food writer specializing in tacos. He’s written for Texas Monthly, Munchies, Dallas Observer, D Magazine, Imbibe, this fine online media outlet, and other publications. Ralat is the author of the forthcoming book American Tacos: A History and Guide to the Taco Trail North of the Border, and he doesn’t believe in the existence of an inauthentic taco. Follow his trek on the Taco Trail at his website www.thetacotrail.com and on Twitter.